Below is a chronology of the Bronte Swimming Club. . 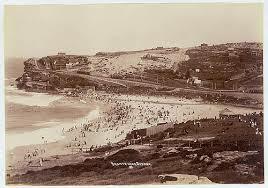 Please also refer to our History Photo Gallery for historical photos of both the Club and swimming at Bronte Pool. A Full history of the Club and Bronte Pool is available via downloadable pdf documents BELOW. The chronology of Bronte Swimming Club Inc.
1888 6 Feb - Bronte Baths opened. 1894 Royal Life Saving Society established in Waverley with Major Bond as first Instructor. This is only 3 years after the RLSC was established in England. 1905 NSW Women’s Amateur Swimming Association formed. 1905 31 Oct - Eastern Suburbs Swimming Club - Ladies Branch (known as the Eastern Suburbs Ladies Swimming Club or Eastern Suburbs Ladies Club) is formed. With first meeting held at Browns Hall, Bronte. Swims at Bronte as well as other pools including Coogee Aquarium, Farmers Baths (Rushcutters Bay and Rose Bay ) etc. Miss M Brown, (Brooke’s great grandmother?) was a competitor. 1906 Eastern Suburbs Ladies Swimming Club now fully operational. Office holders for 1906/07 season were Mrs G Rowles (President), Miss A Sandilands (Captain and Instructor), Miss E Hegarty (Secretary) and Miss M Brown (Treasurer). 1907 Miss Gladys Tate (16) won the 100 yards ESLSC championship in 1:22:2/5 seconds. She defeated Dorothy Hill and Fanny Durack. (17). Gladys Tate turned professional in 1911 and swam match races for prize money up to10 pounds or more. 1908 Gladys Tate and Fanny Durack of ESLSC selected for Australasian Championships held in Brisbane in March. 1909 31 Oct - The newly formed Bronte Ladies Swimming Club held its first session including 31 ladies. They held a swim in the bogey hole and then had afternoon tea in the Park. There is little subsequent evidence of its continuing existence. Assume the swimmers were absorbed into the ESLSC over time. 1909 The Eastern Suburbs Ladies League Swimming Club formed and started swimming at Farmers Baths, Rushcutters Bay. No evidence of its existence past 1912 is available. 1912 Feb-March - Fanny Durack of the ESLSC breaks world 100 yards record twice taking it to 66 seconds. She subsequently won gold in July at the 1912 Stockholm Olympics with Minna Wylie second. 1916 Eastern Suburbs Ladies Amateur Swimming Club was formed by Annie Brown and Fanny Durack to compete in NSW Ladies Amateur Swimming Association events. It is still based at Bronte Baths. 1922 1 Aug - Death of Mrs Wylie, Minna Wylies mother. 1942 ESASC closes for World War II. 1948 ESASC renamed Bronte Ladies Amateur Swimming Club (BLASC) by the members of the old ESASC. 1991 Bronte ASC (Men’s Club collapses). Boys first, then men, join BLASC. 1998 BLASC changes name to Bronte Swimming Club Inc. and becomes a Family Club for both ladies and men.